T. McNerd, Welcome to the Nerd Mind! Please Don't Kill Me, Please? There once was a brave hero tasked with saving the world. He was quite quirky and had one of the foulest mouths in the world. In addition to his foul-mouth he was one of the biggest pervs ever to walk the earth. This hero was named Duke Nukem. He made his first appearance in the 1991 game Duke Nukem. he made two more appearances in Duke Nukem 2 and Duke Nukem 3D. However, there has been one more game released as of late. This game has been ridiculed and called one of the worst games of all time. That game is Duke Nukem Forever. I will openly admit that I have never played Duke Nukem Forever. However I do know a number of people that have played the game so I have assembled the info that i have gained from them for this piece. One of the contributing factors to Duke Nukem being so badly reviewed was because of the history behind it. Duke Nukem Forever was stuck in development for almost 12 years before finally being released. When it was released there were a lot of problems with it. The controls were sadly not the best and, at times, were degraded to a basic rail-shooter which wasn't what made Duke Nukem so appealing in the 90's. Many fans of the series have admitted that they were less than impressed with Duke Nukem Forever. One of the contributing factors to the disappointment was that with all the time it took for the game to be developed everyone was getting worked up, expecting the next big leap forward for the industry. Just like Duke Nukem, I have taken to long to update the blog. Unlike Duke Nukem, I will not deliver mediocre content to consumers of this blog. However it will be harder for me to update And I will only be releasing content over the weekends due to a busy weekday schedule. Thank you for your continued support and please, Don't kill me. There is a phrase that has become a wide spread internet meme. It's a fairly simple meme, but it is still an interesting and popular one. It goes, "I am Error." which appeared in the Legend of Zelda 2. Error himself was a very minor character who didn't play much of a role in the game, and yet he has attained internet fame. When fans originally saw this piece of dialogue they weren't quite sure what to think about it. Some believed that there was a bug in the programming that didn't allow the name to be properly rendered and produced an error message. There is also another theory about Error. In another town in the game there is another character, who looks very similar to Error, named Bagu. The interesting thing about the word Bagu is how in Japanese it means bug. So it is thought that when Nintendo were making this game they decided to reference errors and bugs in programming. It's hard to tell what Nintendo were doing when they created Error. Was it an error in the game coding that presented an error message in the dialogue box? Or, was it the case that Nintendo referenced bugs and errors in coding? Nintendo has not commented on this and Miyamoto hasn't been very helpful either. We may never know the truth about Error for years to come, but until we know we have the theories. If you know more about Error, drop a comment! Or if you have an opinion, or just have something to say leave a comment. Now go forth, and nerd. The Legend of Zelda has produced many great and original characters, but it has also produced some very strange ones. One of those strange characters is the Happy Mask Salesman. 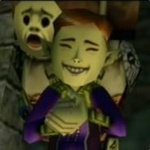 The Happy Mask Salesman made his debut in the Legend of Zelda: Majora's Mask. He played a very important role in the game. The story behind him is that he travels around the world selling masks to anyone and everyone who can pay for them. One of the masks he carries is a cursed mask called Majora's Mask. At the beginning of the game, you meet the Salesman who explains that an imp called the Skull Kid had stolen the mask. This is very bad for everyone because Majora's Mask is a cursed mask that contains the soul of a demon. From there the protagonist of the game, Link, has to go out and stop Skull Kid within three days, otherwise the demon will destroy the world. The entire time that Link is out saving the world, the Happy Mask Salesman is beneath a clock tower in the middle of the main town in the game, Clock-Town. There are many theories that have circulated regarding the Salesman and who he is. One of the most interesting is that he is from the moon. This theory has come from three children that look very similar to him that show up on the inside of the moon (the moon is the final level of the game) and say that they want to be mask salesman when the grow-up. Does this mean that there is an entire colony of orange-haired people that, when they grow up, come down to the earth and sell masks? A more likely possibility is that the Salesman was possessed by Majora's Mask. When Majora went to the moon to escape Link, he needed more people to project himself into. Majora used the appearance of the one person that he was the most familiar with and just projected it three times. Whatever the explanation of the Salesman, he is one creepy customer. He may even be the human form of Majora! However, there is almost no way that we will ever know unless Miyamoto sheds some light on the creepy ginger. I hope that you liked the first of my Zelda themed posts. The rest of the month will have something to do with Zelda. If there is something that you want to tell me, e-mail me at tmcnerd@gmail.com or just drop a comment below. Hello dearest readers. There is one series of games that I hold near and dear to my heart. 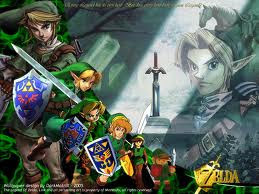 That series is the Legend of Zelda. Almost every entry has great, it has even produced a few masterpieces. So I am celebrating this fantastic series with a Zelda month. Throughout the rest of the month I will be doing nothing but Zelda themed posts. Quote Wednesday will be graced with some of the masterful dialogue of the series and for Comic Saturday I will be reviewing a few selections from the manga series based on the games. I hope that you enjoy what I have in-store. 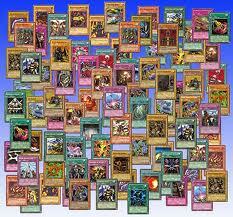 In recent weeks I have found myself looking through my collection of Yu-Gi-Oh cards. I was never really that great at the game, but I had a lot of fun. I stopped playing for about a year because I had all sorts of stuff going on that prevented me from going to my local club. Yet I found myself looking at an old deck of mine and thinking, "Wasn't that a fun time?" So I picked up my deck and started fiddling with it. I removed a few cards here, added a few cards there and soon enough I had a decent deck built. Once I had accomplished the feat of creating a deck I felt like it only made sense to put it to use. I called up a friend and we had a quick duel. That duel reminded me of how much fun I used to have. Most of the fun that I had came from a club that I used to go to. I had made a lot of friends at the club and we always made each other better with every game. That experience that I had with the club has gotten me to think. People are capable of making friends and having a good time through a card game. While some call people dorks just because they play Pokemon or Yu-Gi-Oh and consider it a bad thing, it really isn't. It's a social event to collect the cards and play these games. While there are more important things in the world, that doesn't mean that someone can't have a hobby. I've started playing again, and while I may be a little rusty, I'm still having a load of fun. If you haven't heard, I'm still looking for a guest writer on the blog. If you are interested please e-mail me at tmcnerd@gmail.com with your name and article. If I like the post I will write you back and then post your article giving you credit. This famous quote has taken the gaming world by storm since its appearance in Castlevania: Symphony of the Night. Symphony of the night was released on March 20, 1997 for the original Playstation. 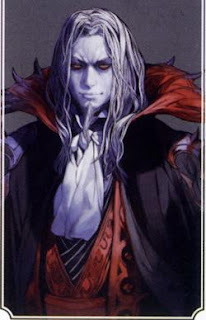 Castlevania has long since been making an appearance on store shelves for both handhelds and console games, with a new one slated for release on November 16th, 2012. The series has a long standing history of good story and gameplay, however there are a few bad apples. Even so, those few bad apples aren't too bad. There is also another game to be released for the Playstation 3, which is a sequel to the first game also released for that system. Unfortunately, Castlevania hasn't really become a household name like Mario or Link have, but part of that can be attributed to the fact that the characters are constantly changing and that it is geared towards a slightly older audience. However, despite this many children have the ability to play the games because of the easy accessibility and gameplay of the handheld games. Of course, what does this have to do with the name of Dracula? Throughout all of the games you are playing as a vampire hunter of one sort or another and hunt vampires. In the first one for the NES, it made sense to use a vampire that everyone knows and loves as the main villain. After that, however, Dracula simply became the main villain and has made an appearance in many of the games to date. Castlevania is a great videogame series. While it's not as popular as some of Nintendo's other franchises, it is certainly one of their better ones. There is much to look forward and I can't wait to see what they do with this series. As usual, leave a comment if I left something out or you have a different opinion. I am still trying to fill that guest post slot so do not forget to send your article to tmcnerd@gmail.com. Regenerations: Hollywood Special Effect or Time Lord Invasion? Love The Nerd? Get The Email Newsletter! Welcome to the Nerd Mind! Are you excited about the new season of Doctor Who?